This is an organizational chart of the motion picture production team for preproduction and principal photography. This easy to read chart lays out the chain of command involved in making a film: These key players must be in place before the film begins development. Producer, Director, DP, Cam Operator, Prop Master, Art Director, Wardrobe, Set Construction, Script Supervisor, and many more. If you are an independent filmmaker, or you are interested in starting a career in post-production, it is important to understand what happens to the film when it goes from the final cut to the editing room and then into the theatres. It is a long and winding road to the theatres and there are various distribution options. 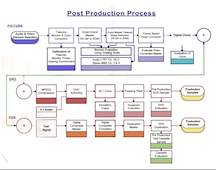 This chart shows the complete path of the film from the production to the answer print. It maps out the path including the process negative, telecine, sound synchronize, video dailies, 3:2 pulldown, editing, negative conforming, screenings and answer print and all the way to its final showing in the theatres.. The back of the chart shows the complete process for worldwide distribution on DVD and VHS. It is a detailed map from Telecine to the DVD Disc and/or VHS tape. This chart is a must for anyone wanting to understand what to do with their film once it’s “in the can”. When your film is “in the can” getting it to the consumer is the final step to making money and getting it seen by the world. To do this you can either self-distribute or get a distributor. If you are securing a distribution deal you need to know the basic release patterns, from a Saturation Release to a Non-Theatrical. If you are going to distribute it yourself you need to understand “sequencing” which maximizes the revenue from all the global markets from the theaters to the cable channels. Understanding the road to distribution is a very important step in the filmmaking process and without it your film will most likely sit on the shelf and collect dust. The Distribution Chart lists the complete road and detailed information on how to do it. The Front of the chart goes through each release pattern in detail and covers every sequence for self-distribution. The back of the chart is a full color-coded description of these concepts in even more detail. This is must for any filmmaker who has a finished film and is ready to get it out there.